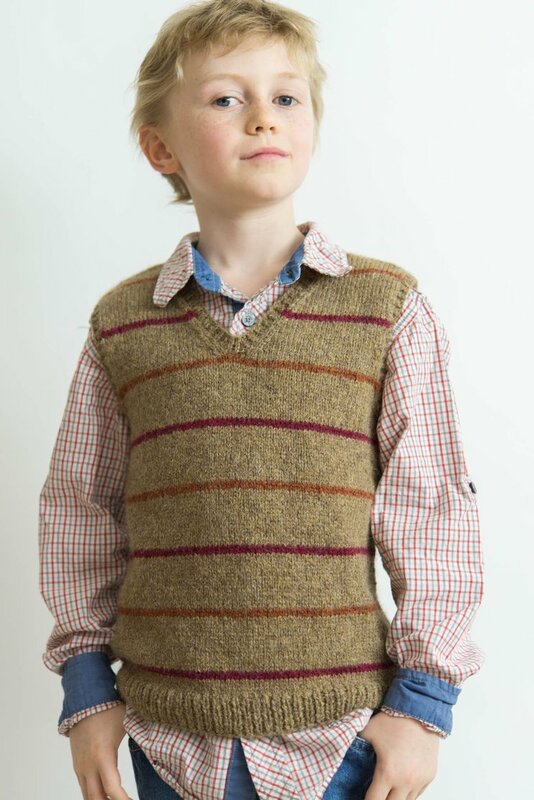 Striation is a classic sweater vest that works for anyone, with fun stripes to help you use up those bits of leftover yarn from much-loved projects. 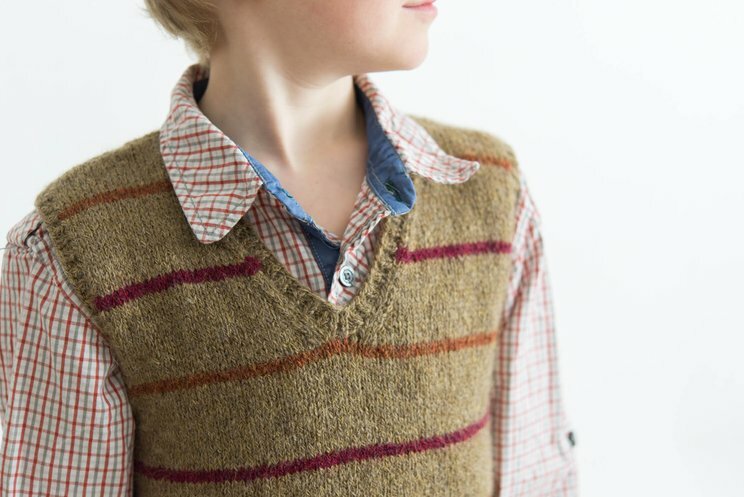 The straight-silhouette, v-neck shape is easy to adapt to anyone you'd like to knit for, in any gauge you like. 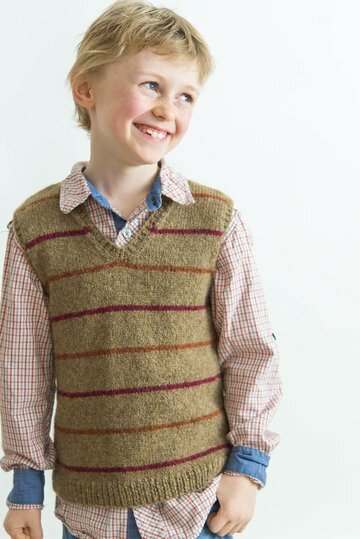 This vest is an average-length, sleeveless pullover with V-neck shaping and 1x1 trim everywhere. The hem is trimmed with 1¾"/4.5 cm of rib, the neckline with ¾"/2 cm, and the armholes with ½"/1.5 cm. 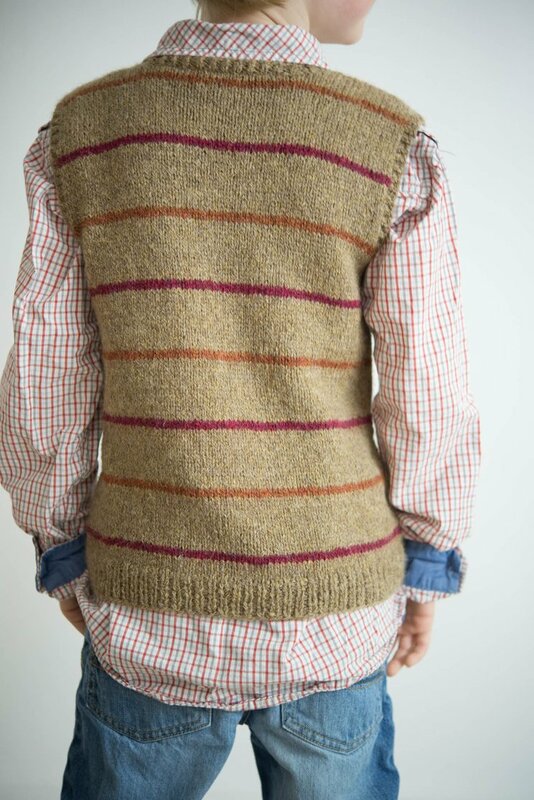 Dan is wearing this vest with a child's average fit. 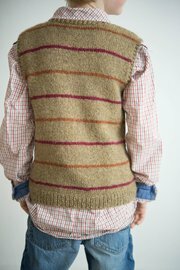 The neck shaping starts 1''/2.5 cm above the armhole shaping, to ensure this look no matter who you're knitting for. As shown, you'll need 3 colors of yarn - the MC, and two alternate colors. 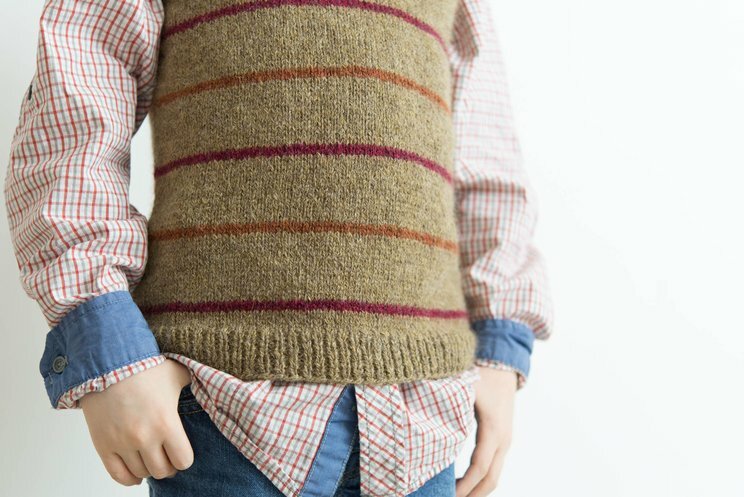 However, the stripe pattern is flexible, and you should definitely feel free to mix things up however you like - make all the stripes the same color, each stripe a different color, or whatever else your preferences and available yarn dictate. At Dan's insistent request, Amy worked this sample in the soft, stretchy, luscious Rowan Lima in colors 888 Lima (MC), 891 La Paz (CC1), and 885 Machu Picchu (CC2). Lima comes in a lovely array of complementary colors, and is both warm and soft - a great set of choices for any sweater. Amy likes Lima at a gauge of 22 stitches and 26 rows to 4'' (10 cm).